and that began the harnessing of my delightfully chaotic energy. My preschool years landed me on an island with an armload of friends living in the rest home next door. They had happy face wrinkles and white hair. On the other side lived my grandparents. In front of our home was a lake where we swam and fished and skated. So, my early schooling was wise elders and natural science. I was a child of busyness with the energy that has propelled me throughout my lifetime, back then it was enjoyed as Dennis the Menace—only I and my sister were girls. My grandmother was schooled in child development in the early 1900’s and she was filled with lovely childhood ideas. My mother crafted and created opportunity for imagination, read to us daily and directed us in the proper ways to talk, walk and eat. She shared us with her community activities of church and scouts. There was always abundance of paper and crayons and scissors and glue. She did not fear big messes. My father was a carpenter. If he could dream and invent it he could build it, and if it was broken he fixed it. If we broke it we fixed it with him—we seldom bought new. “You see that Red Wing Blackbird? He admonished, “Can’t won’t be in this family’s vocabulary. Pick a “Be Still” spot for yourself where you can go and learn to notice the unnoticeable. This is your place to learn to calm and grow yourself. First simply go to observe then bring a journal or sketch pad. 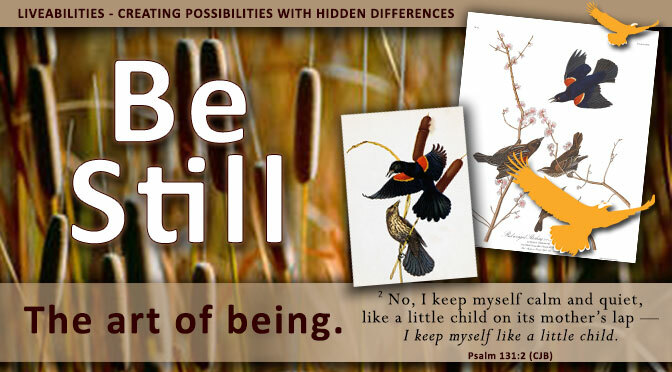 Share your “Be Still’ spot with your child. Learn to watch the little together. Learn to ask questions. Have quiet fun. Ask your child, “What’s your favorite place in the yard/neighborhood/around here?” Let your child choose their place—it may be under a special tree, by the downspout, in a garden, a swing, on top of a slide. Walk with your child to their favorite nearby place. It must be outdoors where they can sit and watch and learn. Ask your child, “What do you like about this special place?” “How does it make you feel?” Hopefully, it is a calming place, if not you will need to create one together. “Let’s make this your special ‘Be Still’ place and you can share stories with me of everything you learn here.” Provide a small box that is water proof and won’t blow away with paper and drawing tools for doodles, sketches, and musings that the child can take to the “Be Still” spot. Needless to say a great big will rose up inside of me. To empty my busy brain in meditation only created more energy—to focus on creation opened and soothed my mind and filled it with brilliance. I couldn’t sit still and everytime I moved Blackie. Tiny step by tiny step my father challenged each of my weaknesses to become strengths. He often said, “Show me. Tell me. Ask me.” “I don’t know, let’s find out,” from my father meant we were going on a book adventure. A big set of child encyclopedias, next to the adult bigger books held the answers to my unanswerable questions. I learned to trust my father’s ways of learning and value my thoughts and curiosity. Blackie became my first own real animal friend and in time together we learned many things. He had a special call for “more” of whatever I was feeding him and he even ate out of my hand. I saw Blackie leave in fall and come back in spring after the ice crystals on the lake sang to me as a choir before sinking into open water. And I learned to calm myself and be still while setting aside my robust energy. Blackie didn’t forget me when he returned north. He still expected me to feed him sunflower seeds and corn. I guessed he missed me. Meanwhile I had begun working on befriending a chipmunk “Chippie” and a squirrel “Peanuts” but that’s another story. Blackie died the summer I was four. Death of a friend was new to me. Millie’s big old black cat Midnight pounced and ate him. Dad hugged and held me close and we buried what was left of him in the garden. We talked about how cats eat birds and birds eat bugs. It was the way of the world and sometimes when we reach into another creature’s world especially in the outdoors life happens and we need to get over it and be thankful for the gifts of the relationship. Blackie gave me so much more life value than I gave him—he taught me to sit still and learn to calm myself to notice. At least for a while. In my personal sit spot, I learned about life and myself as long as I remained observant with my full being. As long as I sat with quiet respect for my surroundings and the creature who arrived to meet me. I met frogs and toads carefully seeing how they differed. I watched as spiders wove webs between tall stalks of grass to catch flies. I noticed that the ants carried huge items compared to their small size. I saw angle worms left upon the earth after the rain. I saw fish jump, dragon flies connect and muskrats swim. I watched patterns of life and followed ripples of water and wafts of air. And each thing I saw or smelled or heard birthed questions that my older friends were happy to answer or help me discover where to find an answer or how to figure it out. How I use the sit-spot as an adult. I use the skills I learned in my dad’s “Sit Spot” everyday of my life. It is the skill that has allowed me to see my daughter through her eyes and value her. It is the skill that has allowed me to reach traumatized individuals and animals and pause giving the space for valuing their learning process. It has allowed me to inspire learning in positive small precious steps. More than that it allows me (most times – after all I am human) to keep a balance in the storms of life. Thank you for letting me share. Feel free to SHARE – like and comment. This entry was posted in CALM, CLARITY, CORE VALUES, FETAL ALCOHOL, Jodee Kulp and tagged ADD, ADHD, Calming child, meditation, tame a bird. Has my book “Summer Snow” arrived and have you had a chance to read it? Will be working on review this weekend. Thank you for bringing this book to my attention.